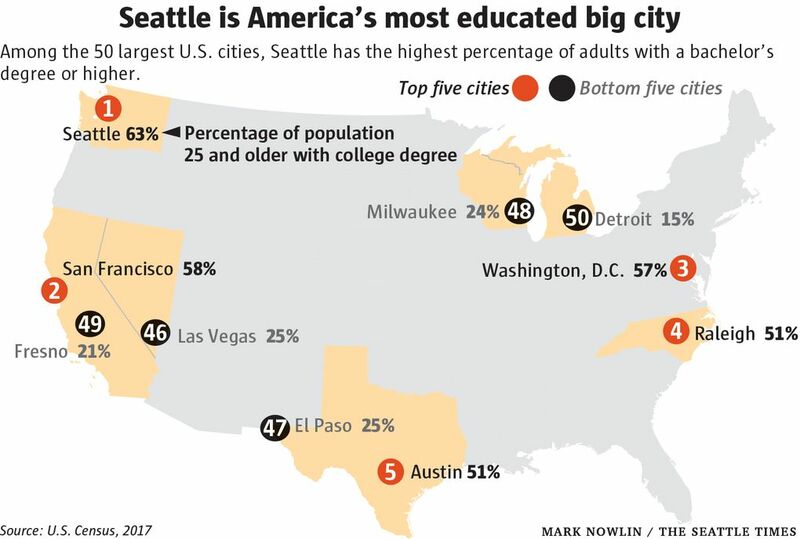 Seattle has for decades ranked as one of the most educated cities in the country. And that's especially true for people who have moved here recently. Americans are more educated now than they’ve ever been in history. A report released last week by the U.S. Census Bureau shows 35 percent of Americans age 25 and older have completed a bachelor’s degree — that’s equal to the percentage that had completed high school in 1950. And the number of folks who hold an advanced degree has doubled since 2000. Even in the context of this nationwide education boom, Seattle stands out. While we have long been counted among the best-educated U.S. cities, the rise in the number of college graduates here is still remarkable. As of 2017, 63 percent of city residents age 25 and older had a four-year college degree. Among the 50 largest cities in the country, we’re the only one to hit that 60 percent mark — something we first achieved in 2015. In 2000, less than half (47 percent) here had a college degree. There are now a total of 337,000 college graduates age 25 and older living in Seattle, plus another 23,000 under the age of 25. With each new generation, the level of educational attainment increases. Among Seattle millennials (ages 25-34), 73 percent are college graduates. For the city’s senior residents, it’s slightly more than half. Another shift has occurred along gender lines. Among older adults, more men than women have completed a college degree. The reverse is true for younger Seattleites. When you look at educational attainment among America’s largest cities, the gap from top to bottom is astounding. Along with Seattle, there are five cities where the majority of adults have college degrees: San Francisco; Washington, D.C.; Raleigh, North Carolina; Austin, Texas; and Minneapolis. Portland is right at 50 percent. At the other end of the spectrum, a mere 15 percent of Detroit adults have a college degree. In 13 more cities, it’s less than 30 percent. It’s as good an illustration as any of the troubling gap between cities that are winning and those that are losing in the new economy. Successful cities like Seattle draw thousands of college-educated people from all over the country and the world to work in tech and other sectors. That’s great — but are we producing enough of our own college grads in Washington? Compared with other states, it appears that we don’t actually send a high percentage of our high-school grads off to college. According to state figures, 59 percent of students who graduated from Washington public high schools in 2016 enrolled in college within a year of graduation; about 54 percent went to a four-year school, and 46 went to a community college. Both a state policy agency (the Washington Student Achievement Council) and a business group (the Washington Roundtable) believe more students need to enroll in some kind of training or degree program after high school to keep Washington’s future economy humming along. 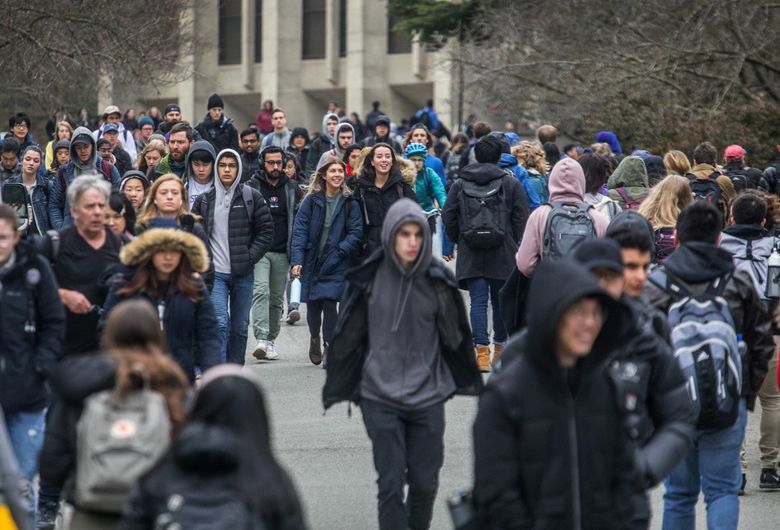 Among Seattle residents, 59 percent of those born in Washington are college graduates, compared with 70 percent of those born in another state, according to census data. And among those say they’ve moved to the city from another state within the past year, an incredible 80 percent are college graduates. More than one in four (27 percent) people who live in Seattle have an advanced degree, such as a master’s, a professional degree, or a Ph.D. Only one major U.S. city has a higher percentage than Seattle: Washington, D.C.
From an economic standpoint, it makes sense that so many here have a college degree or higher. We all know it’s not cheap to live in Seattle, and those degrees tend to translate to significantly higher salaries. In 2017, the median earnings for a Seattle resident with a bachelor’s degree was $66,000, and for someone with an advanced degree, $80,000. For a Seattle resident who had not completed high school, the median was just $22,000. Among midsize cities, Bellevue ranks among the most educated, and has an even higher percentage of college graduates than Seattle — as of 2017, 68 percent of residents 25 and older. Seattle Times education reporter Katherine Long contributed to this column.